My love for real estate began in the place where I grew up and still call home today… Riverland Terrace. 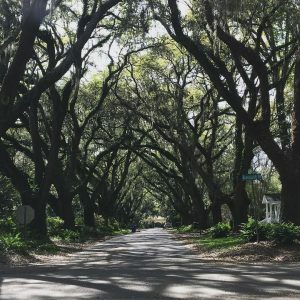 Upon entering Riverland Terrace, you are captured by the gorgeous sight of more than seventy live oak trees cascading their branches down Wappoo Drive. Homes in Riverland Terrace start around 300,000 all the way up to the 3 million dollar range for a waterfront home on either the Intercoastal Waterway or The Stono River. Riverland Terrace really has something for everyone. Fun facts about The Terrace: It is James Island’s oldest neighborhood and has approximately 800 homes. Residents have access to the Riverland Terrace Public Boat Landing and the City of Charleston Golf Course (a.k.a. “The Muni”). Residents recently started a community garden at Medway Park. I walked by there about a week ago and it really is a wonderful thing to see members of the community coming together to promote urban farming. One of the reasons why I have never moved out of The Terrace (I currently live one street over from the house I grew up in) is the location. I’m only a few minutes from historic downtown Charleston (which is great if you work or study at College of Charleston or the Medical University of South Carolina) and a few minutes from Folly beach. Not to mention that I am only walking distance from some great restaurants, such as: Maybank Public House, The Lot, Zia, and Crust. And on Sundays, Todd and I can usually be found at the Sunday Brunch Farmers Market behind the Charleston Pour House. I could go on and on forever about the place I’ve called home for so many years but I prefer the pictures to do the talking…to see fantastic homes in Riverland Terrace Click Here!